Should I use compression socks when Flying? What can I do to help prevent Deep Vein Thrombosis? Should I use compression socks when Flying? 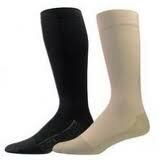 We are frequently asked by patients if they should use compression socks when flying. The answer is … maybe. Let’s first look at the underlying rationale behind the idea. Finding yourself immobile for an extended period of time has the potential to cause serious health issues. Air travel gets singled out as a cause more often due to the long periods of inactivity, cramped seating and a tendency to become dehydrated. Lower than normal air pressure in the cabin can also encourage swelling. Dehydration occurs more easily in flight due to the air condition within the plane, the tendency to drink alcohol and the avoidance of drinking enough water – perhaps to avoid toilet queues or disturbing other passengers. This can lead to a number of circulatory problems from swollen ankles and tired aching legs, to more serious medical conditions such as Deep Vein Thrombosis. A DVT is a blood clot that forms most commonly in the calf. It can cause a great deal of pain accompanied by swelling, redness and heat in the area. If you have a DVT, it is important to rest until you can seek medical attention. Do not massage the area, particularly with any sort of vibrating tool or couch, as this can increase the chance of the clot breaking free from the vein, where it will be carried back to the heart and lungs. This is called a pulmonary emboli (literally a lung clot) and is a serious medical condition that can even become life threatening. The symptoms of a pulmonary emboli include rapid heart beat, shortness of breath and chest pain. While, statistically the chance of dying from a clot gained while traveling (colloquially known as ‘economy syndrome’) is quite low, given the extreme nature of that outcome and the simplicity of performing the preventative actions, one might as well be better safe than sorry. Specifically, exercise your legs while seated, get up at regular intervals for a walk, drink plenty of water and avoiding excessive tea, coffee and alcohol. If you have any pre-existing risk factors such as known blood vessel disorders or if you commonly gather excessive fluid around the ankles, you should consider wearing a sock that delivers a mild compression (about 10 to 20 mmHg) to the legs to discourage swelling. Discuss with your doctor whether a low dose aspirin tablet may be appropriate for you (generally not to be used with any other blood thinning medications). Use this link to see our Healthier Socks section. Use this link to return to the Podiatry FAQs section.